Miriam ‘Midge’ Maisel does not stop talking, not for a second. One expects no less from a woman conceived by the same minds that gave us Emily, Lorelai, and Rory, but unlike the Gilmore women, one suspects that the 28-year-old Jewish housewife and mother of two has long given up on an audience. Yet, to watch Maisel cook a brisket or visit her (delightfully neurotic) parents or change the baby’s diaper, is to witness a woman in character. A friend once told us a story of how he fell in love in Portugal. By the end of that summer he’d made plans to move there – only to return to India and discover that his feelings had changed. But I went back anyway – he laughed – because I thought of that splendid toaster we’d already bought. To watch Maisel in a moment of crisis is to be reminded of that toaster. Her concerns are not of the abstract kind – before she confronts her husband, Joel, about the woman he is leaving her for, she double-checks that he will not, in fact, take her suitcase. But we finally got the rabbi for Yom Kippur! – is her primary objection. 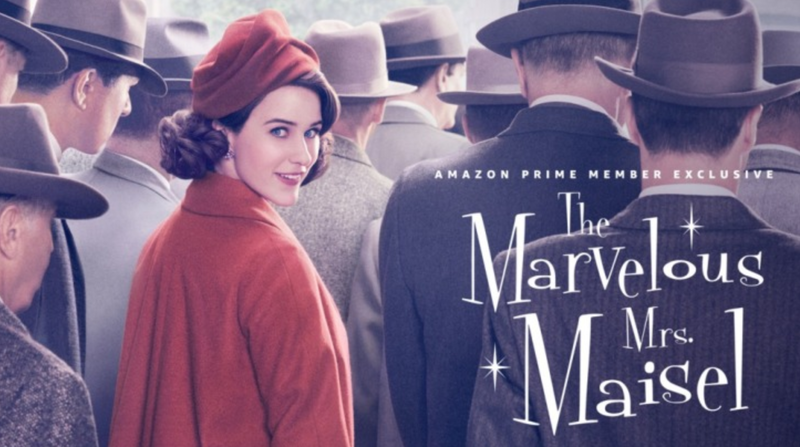 Maisel’s reaction becomes less confusing the more one considers how her time is spent – managing the lives of others. At The Gaslight Café, (the famous New York coffeehouse that showcased the likes of Allen Ginsberg and Bob Dylan before it closed in 1971) Joel takes the stage, and Maisel takes a seat. While he dives into a stand-up routine (which we later discover has been plagiarised from the great Bob Newhart), Maisel watches the audience’s reaction to every joke, making detailed notes in a book. She is the iconic 1950’s woman – her day divided into taking her children on walks, attending aerobics class, and organising elaborate dinner parties. We watch as she waits for Joel to fall asleep before she dashes out of bed and puts on a night mask – only to wake up before he does and replace it with makeup – and wonder whether it is funny or disturbing that she measures her ankles and calves every night before dinner. Like so many before and after her, Maisel is not just manager of her home and family, but also of herself, examining her body as though she were standing outside of it. My mother likes to tell everyone about how, at age four, I once spent a 100-metre dash pulling my hair out of its ponytail, tossing my locks from side to side like a deranged baby lion. It was sports day and for a brief moment I forgot that I was meant to be competing. There must have been a tentful of teachers and parents watching the race, but all I remember is the feeling of being in the middle of that track, the wind in my hair as the other girls whooshed past me towards the finish line. I like to think that Maisel experiences a similar feeling when she first takes the mic at the Gaslight bar. On stage, she is finally out of character – as though the presence of a physical audience has permitted her to dismiss the spectators she is otherwise accompanied by. There is a page in The Bell Jar where Plath describes a fig-tree. She writes about how each fig on the tree represents a different possibility – one, a life of domestic bliss; another, a successful career; a third, a life of adventure and travel, and so on. Days after I read the novel, it was this image, more than any from the sanitorium, that haunted me. I suspect that the panic of the fig-tree is a particularly female one – an anxiety of wanting a life that appears coherent to a world that is constantly looking in, unable to comprehend female complexity. Maisel on stage is Maisel remembering that she is not a silly fig, but the whole damn tree. Of course, it’s often mama fig-tree and papa fig-tree that are looking in most ardently, appalled by what they see. Abe Weissman, father to Maisel, is a mathematics professor at Columbia University. Upon discovering that his daughter’s marriage is breaking apart, he hilariously declares to a classful of boys that the lovely thing about mathematics is that “It protects us from the variables of the outside world.” If you loved yourself a good old Lorelai-Emily-Richard emotional roller coaster, you will not be disappointed by the Midge-Rose-Abe pain train. Yet, like the Gilmores, the Weissmans are most tender when you least expect it, and then you suspect that the only thing they fear more than their daughter having a mind of her own, is their daughter not having a mind of her own. Susie Myerson – Gaslight booker and self-appointed manager to Maisel – fears this too. Played by Alex Borstein (who also played Drella and Miss Celine in Gilmore Girls), the rough-edged Myerson has no patience for Maisel’s self-doubt and often flimsy work ethic. Her belief in Maisel is so strong, it is almost cruel. There are many shots of Myerson watching Maisel onstage, and it is difficult to tell what she actually sees. Is she blind to Maisel’s struggles because of her hopes for her, or does she have to be, if there is to be any hope? In the fig-tree garden, Myerson is the North Star vigorously denying the morning. Watch the trailer for Season 2 of The Marvelous Mrs Maisel here. “On stage, she is finally out of character – as though the presence of a physical audience has permitted her to dismiss the spectators she is otherwise accompanied by.” I don’t have the words to describe how perfectly expressive your words are <3 <3. The ridiculousness of the world that expects coherence from people whom it denies their complexity! So funny. But of course, so is Mrs Maisel, so complex.